HD Total Eye Health Reviews: Does It Work? What is HD Total Eye Health? HD Total Eye Health is a natural eye supplement that, according to the manufacturer, can improve your overall eye health. The product may be able to improve your vision, reduce eye strain, and it includes alpha and beta carotene (known for their connection with healthy eyes). The product is intended for those who have healthy eyes, and those who wish to improve their vision. Who is the Manufacturer of HD Total Eye Health? 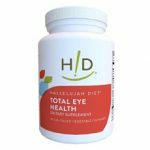 The manufacturer of HD Total Eye Health is Hallelujah Acres, a company known for their Hallelujah Diet (HD). HD has been around for over 25 years and has its own book, published in 2006 to positive reviews. The Hallelujah Diet is based on plants and clean eating, providing supplements to experience a healthier diet. How Does HD Total Eye Health Work? HD Total Eye Health contains various natural ingredients that may help your overall eye health. The formula is delivered to you by capsules that are treated with nitrogen, and the capsules themselves are plant-based. This might allow for better absorption of the ingredients. With supplements, some ingredients may deteriorate before they can help your body, so many supplement companies are trying to create their supplements with better absorption and ingredients. HD Total Eye Health Ingredients – Are they Safe & Effective? This supplement contains a few natural ingredients. These ingredients include meso-zeaxanthin, which is found in the retina. Consuming this may help strengthen your eyes and improve your overall health. Astaxanthin is found in many seafoods, giving fish such as salmon its color. It is reported to help with eye strain, and may help improve your wrinkles as well. Alpha and beta carotene are found in red foods, and they may have the ability to improve your overall eye health as well. Black currant is a type of berry, and this supplement contains extract from it that may help with your night vision. Meso-zeaxanthin – Which may help you improve your overall vision. Astaxanthin – This free-radical ingredient may help reduce eyestrain. In addition, it may be able to provide you with more energy and have antioxidant effects. Alpha- Carotene and Beta-Carotene – These are found in carrots, pumpkins, and other foods, giving them their red pigmentation. They may be able to improve the overall health of your eyes. Black Currant Extract – This may be able to improve how well you see at night. While it won’t give you binocular night vision, you may be able to see better when you’re outside at dark. What are the Advantages of HD Total Eye Health? HD Total Eye Health is reported to help improve your night vision. HD Total Eye Health claims to help reduce your cancer risk by combatting free radicals. For those who use the computer frequently, this may be able to help reduce the eyestrain. HD Total Eye Health is treated with nitrogen for better absorption. It may be a good substitute for those who don’t have enough beta carotene in their diet. What are the Disadvantages of HD Total Eye Health? The supplement doesn’t work instantly. You may have to take it for over a month if you want to see results. One bottle should be able to determine if the product is right for you. Because eyes are so complex, results may vary. Some people may see little change. Supplements are often not a complete substitute for eating foods that are rich in the same nutrients. Some of the product’s claims, such as helping you reduce cancer, may be dubious. How Should You take HD Total Eye Health? With any supplement, you should follow the directions on the bottle. You need to take one capsule a day. For best results, take around the same time and make sure you have some food in you. How Much Does HD Total Eye Health Cost? HD Total Eye Health costs $29.95. This does not include shipping fees, which can vary. What is HD Total Eye Health’s Return Policy? The Hallelujah Diet has a 60-day return policy, minus shipping and restock fees. It is advised to consult the website for more information. Does HD Total Eye Health Offer a Free Trial? There doesn’t appear to be any free trial options at this time. However, with the return policy, there doesn’t appear to be much risk. There are various eye supplements you can purchase, all for around the same price as this one. The supplement claims to use safe ingredients that have a basis in overall eye health. Because of its nitrogen treatment, you may experience faster absorption. Also, your night vision may improve. With any eye supplement, however, there is a chance the product may not give you any improvement. Also, some of the product’s claims, such as helping reduce your cancer, should be looked at through a skeptical lens. Finally, consider eating a healthy diet in addition to taking supplements, as supplements are not a total substitute. While HD Total Eye Health is a competent supplement, you may want to consider other eye supplements as well. It is advised to shop around and do your own research before making your decision.